Chihuahua cross Boston terrier Jack may be small in stature but loves nothing more than hanging out with larger friends at Dogs Trust Shoreham. The bigger the canine companion, the better, as staff noticed Jack was more comfortable in the company of bigger dogs after arriving to the Brighton Road rehoming centre in December last year. 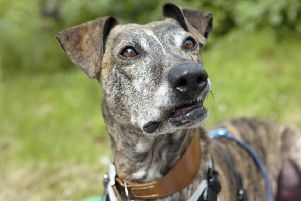 Three-year-old Jack built unlikely friendships with a great dane called Guru, a Staffordshire bull terrier called Kara and a German pointer called Squid, and was happily sharing his kennel space in the company of a golden labrador called Ramsey, but all of these have now been rehomed, while Jack is still patiently waiting. Rehoming centre manager Tracey Rae said: “Jack is so sweet natured and such a funny little character, despite his size he actually thrives when around much bigger dogs. The ideal owners for Jack would be a family who understand a lack of confidence and are happy to build bonds at Jack’s pace. Tracey added: “I think poor Jack often feels a little intimidated by smaller breeds and didn’t mix as well with them at the centre, we were surprised to see that when mixed with some of our larger residents, he was right at home. Jack will need an adult-only home without visiting children, to do favourite things like playing with toys, enjoying a tasty treat and spending time with compatible bigger dogs – a calm and docile, larger canine companion in the home would be the dream. A private garden to enjoy play and exercise with a forever friend is essential as Jack is still working on facing the bigger wide world. Tracey said: “He’d love a doggy housemate that he can snuggle up with, who’d show him the ropes and he can rely on for reassurance.